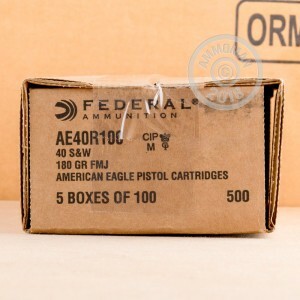 This .40 S&W ammunition from Federal comes in compact bulk packed 100-round boxes for easy transportation and offers exceptional value for all your target shooting and range training needs. 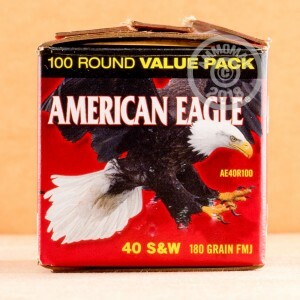 Each round in this box of 100 fires a 180 grain full metal jacket bullet at 1,000 feet per second, producing typical .40 Smith & Wesson ballistics. 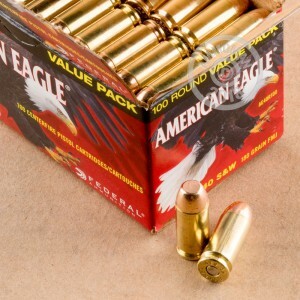 This ammo is made in the USA and uses non-corrosive primers and brass cases. Place an order for $99 or more and get free shipping direct from AmmoMan.com to your doorstep!